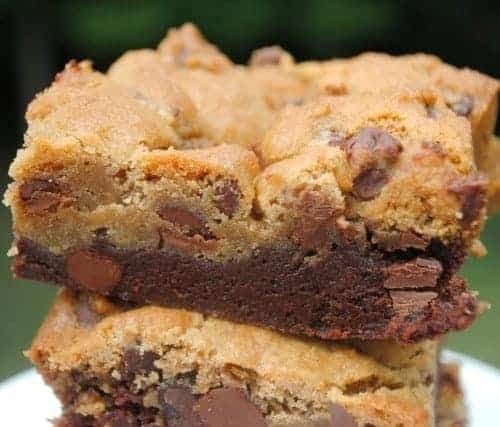 I have a favorite brownie recipe. 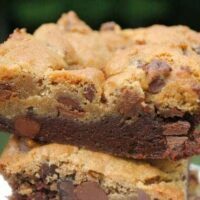 And a favorite chocolate chip cookie recipe. Then one day, they met, and it was love at first bite. Corny? yeah. Actually what came to mind when writing this is those horribly annoying KY commercials. You know the ones. The man and woman talking about the experience, and then WHAALLLAAAA, joy. Okay, I better not go there. This is a family friendly blog. And these Brookies are family friendly! So much so, that my family wants me to make more. And eat them warm with icecream for an even more amazing experience. Nevermind. How about the recipe? For the brownie layer, in a large bowl, mix all the ingredients together until just combined. 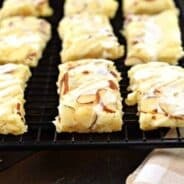 Pour into a 13x9 pan that is lined with parchment paper. For the cookie dough, beat crisco with brown sugar. Add in vanilla, milk and egg. Slowly beat in flour, salt, baking soda and cinnamon. 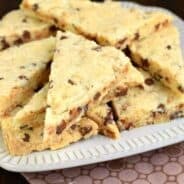 Mix in chocolate chips. 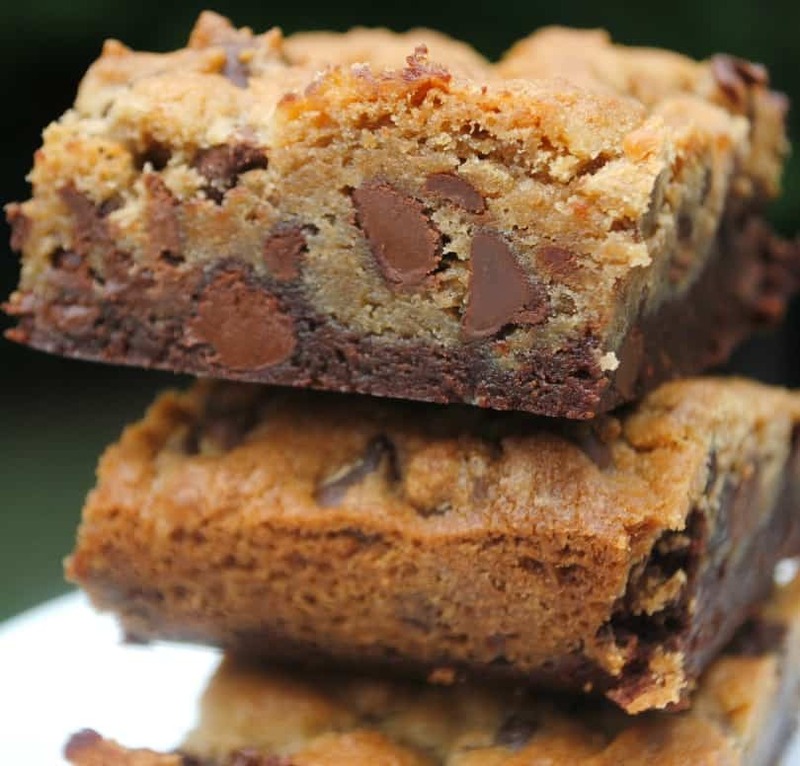 Drop by spoonfuls onto the brownie layer. Bake in a 375 degree oven for about 25 minutes. Allow to cool completely. I refrigerate to speed up the process. Enjoy! yup, definitely one of my fav combos too:-) love!!! My kids love these and I make them a lot. Only I use brownie mix and pillsbury cookie dough. I usually am bad and put ganache on top. Yummy!! I know I will always like your creations! Hahahaha you just compared a dessert to a KY commercial. I love it. I am going to giggle every time I eat one of these. These are fantastic! So good looking! Everything on your blog looks great! Yummm! I’m going to have to try these – I feel a family favourite coming on . . . These look amazing! What a great recipe! 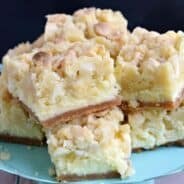 Thanks for sharing your delicious recipes. I hope you don’t mind a copy cat! I’ve never heard of a Brookie so I had to come check them out. Sounds like a real crowd pleaser. You’re absolutely killin’ me with the KY references. Tee hee! Broo-kies — what an awesome combination of two all-time-favs! Enigmeg- I am so glad you enjoyed them! I had to freeze half the batch because I couldn’t keep my hands off of them! Can I use butter instead. I don’t usually buy Crisco. Want to make this for next weekend. Thanks. Gonna have to try these! My daughter and I love Ben & Jerry’s Half-Baked Flavor ice cream~it has brownies and choc chip cookie dough in it. Yum! Can I use butter instead of Butter flavored Crisco? I don’t think I can get this product in Australia. Yes you can. It just may change the texture. I went ahead and used plain flour and they turned out great. I was told to save recipe for the future. My cousin made your delicious maple bacon cookies for thanksgiving this year and I really wanted to try it last night. I went with this Brookie recipe instead since maple extract is so elusive! I selected this recipe because I had everything in my pantry. I don’t know if it was because I used a stone 13×9, the silicone baking mat or it’s simply the awesomeness of your recipe but … Thank you 🙂 I’m going to have another piece now. I baked mine at 375 for the 25 minutes and they were still very undercooked inside but the outside was getting quite brown. I had to put these back now in the oven at 350 and will try 10 minutes at 350 to see if the inside bakes more. Did you find 375 for the 25 minutes worked for you?